As a family who moves a lot, we know the importance of being able to “set-up shop” quickly and beautifully. We have also learned that there are certain circumstances where this interior design process needs to happen at lightning speed. This couldn’t have been more true than for one of my recent clients. As a dedicated military family in a leadership position, they were in charge of multiple events at the exact same time as their move…a move which took them one street away from their former home. They hired me to help pull together the main living area. 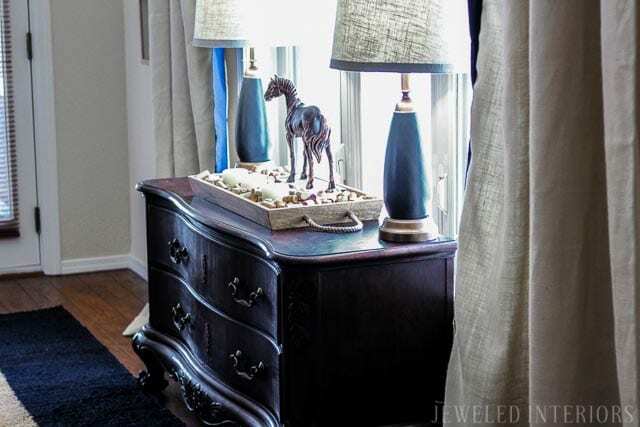 Design inspiration: I was given very specific instructions…Take what they had (which luckily was an amazing collection of valuable antiques) and whip it together in an updated and relevant fashion. Sweet! A smart, gracious, and rational family, giving me full creative liberty to spiff-up their classics ? Um…can you say dream job? It was the “relevant” part of the equation that left me wanting more information. This particular home is special. It would be used for hosting events for people both on and off the military installation. It needed to be magical yet inviting. I knew that I would score bonus points if I could find a way to connect to the local rustic Idaho vibe. As I visited the family at their original home (the one that sat 400 meters away) I noticed a saddle on displayed in the entryway. During the discussion process I realized that the husband rode horses as a child. Western roots! BINGO! There is the connection I was looking for. Let’s give visitors what they would expect when invited to a base leadership home located out West. The vision: Eclectic Idaho-Rustic…but with a heavy dose of “Jewel Polish”… Let’s do this! Rug– What could be more fun than driving to Tandy leather and sorting through three-foot high piles of cowhides in every size and color? Bringing back my top five for the family to help me choose their three favorites- that’s what! 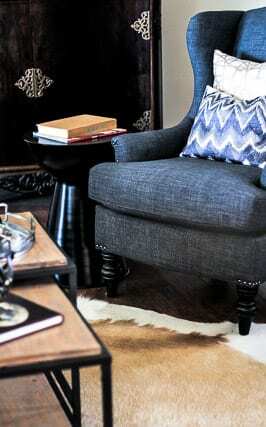 Chairs– I still love these wingbacks (Charcoal Oscar Chair) from World Market. The linen texture added sophistication, and the turned legs tied in nicely with the antiques. 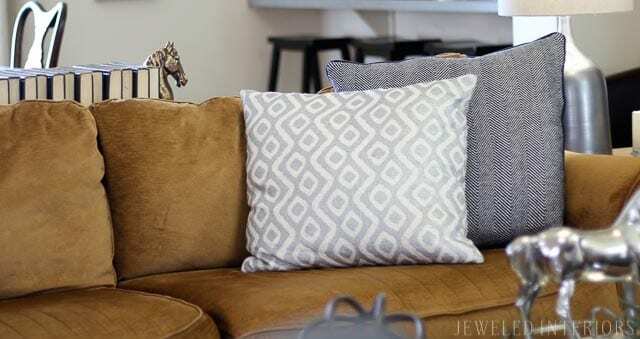 Pillows– Homegoods and (perhaps surprisingly) the budget-friendly Walmart added a touch of bling to this otherwise masculine area. End tables– I’m a big fan of these black Hourglass Accent Tables. 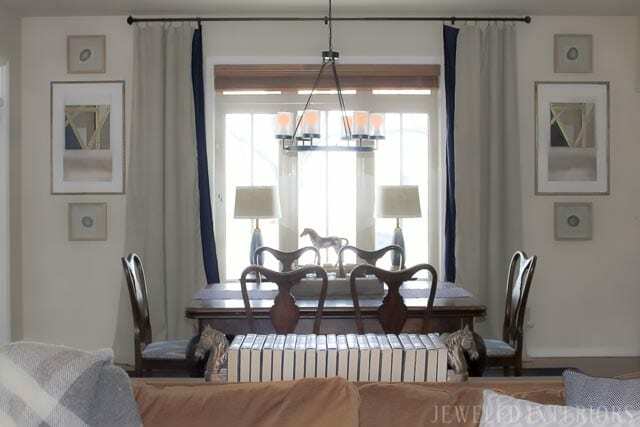 They read slightly rustic, but add a nice modern element to the vignette. To preserve money for elsewhere in the project, the owners opted to keep their original velvet couch. To dress it up (and keep the balance between masculine and feminine), we added a mix of business suit-like tweed, and silver pillows. A beautiful, yet functional wool blanket provides form and function. I painted it in Rust-oleum Antique Brass Metallic. I spray painted the mat with a flat navy spray paint. As an intelligent and well-educated couple, both with advanced degrees, books are an important part of their lives. This needed to be reflected in their design scheme. 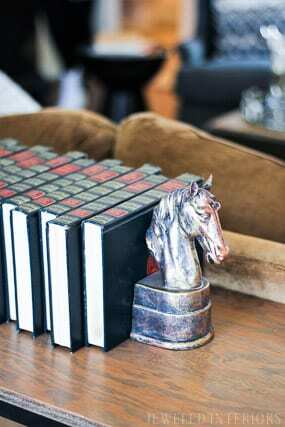 We displayed leather books throughout the room. 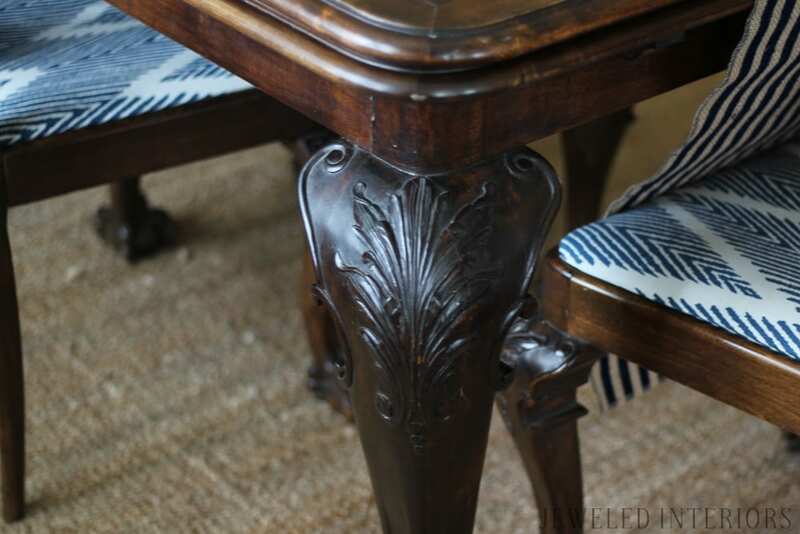 This personalization added a sophisticated and worldly feel to the space. I custom made the coffee, end, and sofa tables (imagine me kissing my biceps for you as I say this). By so doing, I was able to save hundreds of dollars to be used elsewhere in the project. Cha-Ching! Plus, it gave me the liberty to customize the finishes. I will discuss this process in a future blog post. I love the open-concept element of these two rooms. 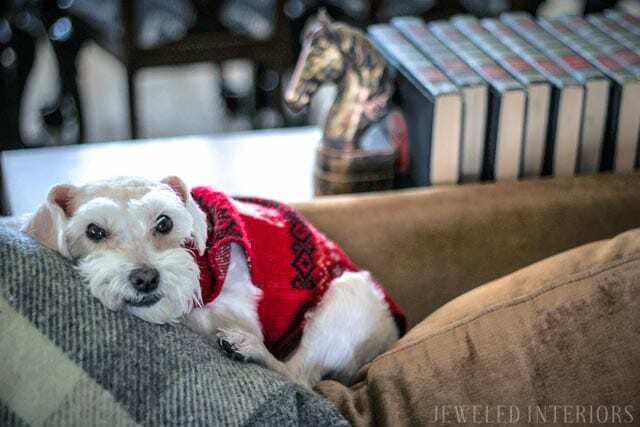 This is the line of sight as you first walk into the home… you immediately look straight to the back. Keeping a consistent color scheme and design flow was of the utmost importance. Importantly, I wanted to accent the height of of the 9 foot ceilings. 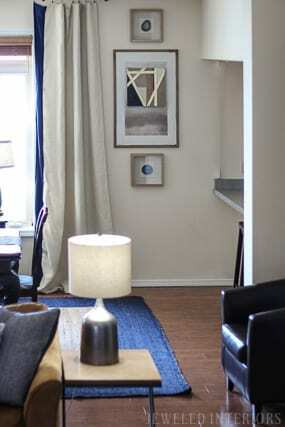 Time to employ one of my favorite tricks… Hang the art and curtains to the ceiling. 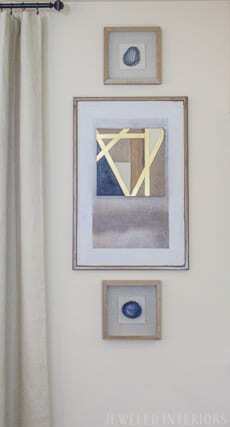 By grouping the art in a vertical trio, it gives the illusion of one tall wall! Let me tell you a secret… The art in the middle of this vignette was only $8. Say what? I will explain the process in a later post. The geode art was scored at Homegoods. I walked in and saw a set of 5. I knew it was meant to be. 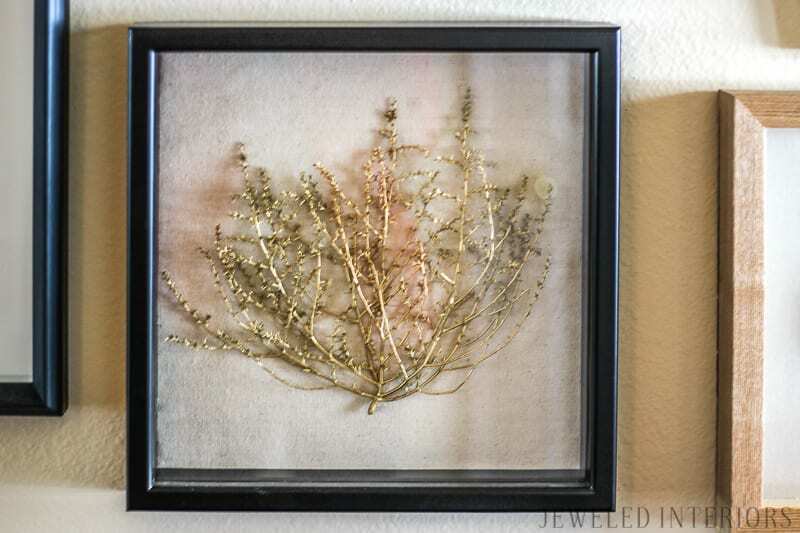 To add cohesion, I hung the fifth of the geode beauties in the entryway, along with this framed tumbleweed (gifted to the family by friends and former residents of this special home). Most everyone knows that custom framing is outrageously expensive. To save money I picked up a set of matching art from the thrift store. I painted the mats (with a foam brush) and spray painted the wood with Rust-oleum Antique Brass Metallic. 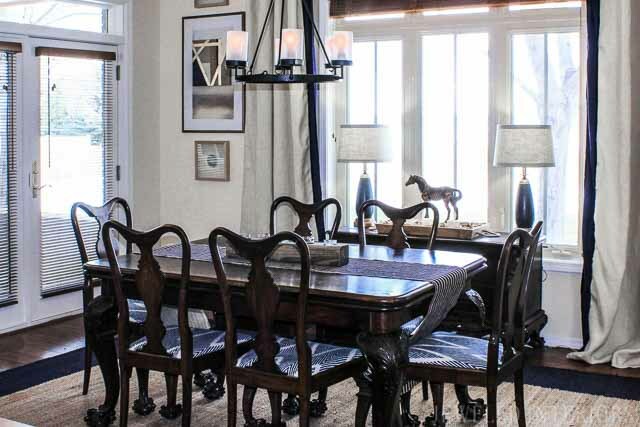 I love the way this dining room vingette came together. 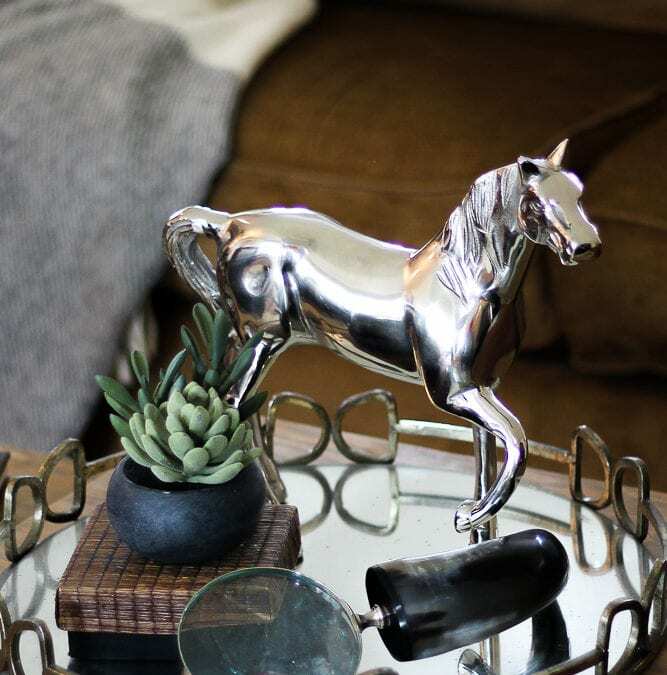 The horse was a Homegoods find, but needed a little umph. The family had a collection of wine tops that added the perfect element of warmth, texture, and conversation starting potential. Notice how it pings nicely off the jute rug. 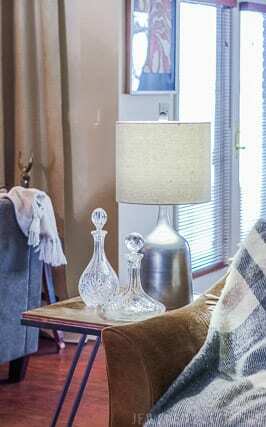 The lamp bases were scored at the local thrift store and toped with Target shades.